I'm recovering from another flurry of Sisterlocks installations and retightenings but I wanted to pop in and share with you a post I wrote for my 'official' blog over at Almond & Avocado Natural Hair Services. This is part of the series I'm calling: Appointment Etiquette. This is the second post in the 'Sisterlocks Appointment Etiquette' Series - but to be honest these are principles that can apply to any personalised Hair service. Let's talk about clean hair. Of course, if your hair appointment/service is for a 'wash and set', 'wash and retwist', 'wash and condition', 'wash, detangle, condition' or similar variation etc' this doesn't really apply to you. "Why do I have to wash my hair within 24 hours of my appointment?" Without wanting to get too deep into the science - suffice it to say that there are 5 layers of skin and the skin we can actually see and feel is the outermost layer of the epidermis known as Stratum Corneum which is constantly shedding as the cells are damaged and die. These shed cells can accumulate and manifest itself as a layer of debris at the surface and needs to be removed by shampooing. Since our skin cells contain lipids and these mix with the naturally occuring oils (sebum) on our scalp - simply brushing or rubbing the scalp will not completely remove shed cells - you need the aid of a surfactant like shampoo to help dissolve the fatty content and properly cleanse the scalp. It is important not to confuse this normal shedding with dry scalp, dandruff or scalp eczema. Now add to this 'normal' desquamation - any environmental pollutants: dust, pollen, microscopic bugs (blown in by the wind while you were walking through the park) and even tiny particles of lint suspended in the air and you can see that without a nice wash the chances of your scalp or hair being truly clean are very low. (This does not mean that your hair will LOOK dirty, in fact it may actually look CLEAN but the particles are there). If you retighten hair with a significant amount of scalp debris, there will be a corresponding significant amount of 'scalp fall' i.e. lots of little white flakes on your back and shoulders after your session. I always cover my clients with a hairdressing cape to protect their clothing but if the scalp debris is excessive this won't prevent particles of dead skin cells from transferring to my own clothing, the floor and the air (and therefore my eyes and nose) while I am working on you. Interlocking is a manual and repetitive process so it is inevitable that tiny particles of debris will be disturbed and dislodged from the scalp during retightening and if this debris is significant it will become noticeably embedded in your locs. Do you really want that? 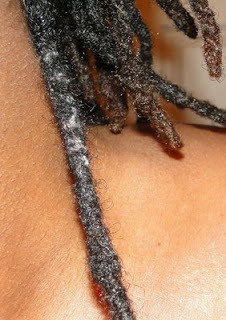 If you retighten hair that contains a significant amount of shed cells, oil (natural sebum or added plant oils), dust, pollen etc - you will cause these pollutant particles to become a permanent feature of your locs as they will become 'permanently' embedded as the dreaded 'build-up' or 'lint-up'! Do you really want that? An ACV soak can help dissolve accumulated build up and using a tweezer to pluck out strands of lint can be fairly successful in redressing these problems but prevention is always better than cure. If you have washed your hair and scalp with the correct techniques within 24 hours of your appointment then chances are there'll be no or very little debris on your scalp when we begin your retightening session as we will have eliminated most of the naturally occurring desquamation and any product or environmental build-up as well. This in turn will help maximise your chances of having debris, lint and build-up free locs in the long term. Q: Why do I need to wash my hair within 24 hours? A: To cleanse hair and scalp and keep your scalp free of naturally occurring desquamation prior to your retightening session. (Remember - skin cells shed EVERY day.) Commit this bit to memory: This in turn will help maximise your chances of having debris, lint and build-up free locs in the long term. If there are any questions you'd like me to answer feel free to drop me a line (see the post footer). These are my words and this is my journey, from 'there to hair'! My life, the lessons learned in and through love and loves ones; and my hair affairs. I really enjoyed reading this post. Hi. I always wash the night before my Sistelocks retightening, however, a couple of times I have experienced this and it's not a good look. I use the Sisterlocks shampoo so what am I doing wrong? Ever wanted to try an alternative therapy?